There could be no better way than several days to disconnect from everyday life only to focus on the beauty of the scenery. Having the relaxed days to the mountain and water area would be a very pleasant experience for who wanna escaping from the over-noising city and long for a vacation that can free oneself in peace. Zhejiang is a province rich in eye-feasting mountains and pretty water with famous, interesting historical sites and distinctive ethnic features close to Shanghai. We specially arrange tourists to take the express bullet train to some extremely picturesque places in the south Zhejiang Province which are around 3 hours train from Shanghai. It is the most common way for Chinese people to travel by train. Following this immensely popular travel route, you can meet and get close to the local people during your train journey. You can visit the dreamy and picturesque, even fairyland like scenery in the mountain and water area here. Tourists will be astonished by precipitous peaks reflecting on the clear green and mirror-like water, delicate rocks and lush landscape alongside streams and rivers. This tour features a blend of natural sceneries, historical and cultural attractions and famous local dishes, and offers you with a whole impression of the Chinese style fairyland like view. Besides, tourists will also take the bamboo raft to drift along the wonderland like Yong’an Stream to enjoy the carefree, snug, tranquil and serene atmosphere there. * Admire Huangdi (Yellow Emperor) who is commonly regarded as "the founding ancestor of the Chinese nation" and "the founding ancestor of human civilization in the oriental world" in the grand temple - one of the 2 major temples of him in China. Anciet Weir Painting Village consists of 2 parts - Painting Village area and Ancient Weir area on the 2 banks of Ou River and Songying Stream - the branch of Ou River and these 2 parts is connected by fancy boat. In Painting Village, tourists can visit the Lishui Barbizon Gallery, stroll on the flagstone paved street in the quaint ancient town by the side of the extremely beautiful water - Ou River. Now this ancient street is famous for its painting and art business in China. Afterwards you will take the fancy boat to Songyin Stream to arrive at the Ancient Weir Area. The natural beauty of the river is indescribable. Excursing here is the unique experience of admiring a true Chinese painting with green hills, fishermen boat and pristine water. This area is definitely the perfect representation of the Chinese mountain and water. Disembark at Ancient Weir area by the side of Songyin Stream, tourists will walk by the side of stream to Tongji Weir which was built in AD 505. Now it is Key Historical Sites under National-Level Protection. Feasting on the fascinating and spectacular scenery around weir in the pavilion over the weir and marveling at the wisdom of ancient Chinese, its surely worthwhile your 2-hour visit. This fairyland like area features an enchanting landscape of splendid peaks, undulating mountain ridges, charming waters, peaceful valleys and weird-shaped rocks that are in harmony with the rural scenery and historical relics. This area is commonly described to excel "Guilin in handsomeness, Yellow Mount in spectacularity, and Mt. Hua in exoticism." It is so pretty that is even considered as one of the 36 Heavenly Abodes in the world in the Taoist Scriptures. 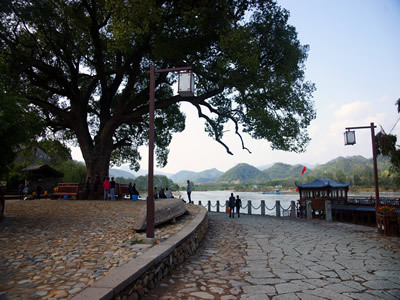 Since the 1950s, more than 30 films like “A Shima (the name of a legendary pretty girl singer in ancient China )” are filmed here. Chinese Historic record says that Huangdi (Yellow Emperor) who is one of the legendary Chinese sovereigns and culture heroes around 4600 years ago, and commonly regarded as "the founding ancestor of the Chinese nation" and "the founding ancestor of human civilization in the oriental world" made pills of immortality and was brought to heaven to become an immortal by a yellow Chinese dragon from Dinghu Peak in the core Xiandu Area. This bamboo shoot like Dinghu peak in the core Xiandu Area which towers to the sky is 170.8 meters high. It is regarded as the No. 1 Peak and No. 1 Bamboo Shoot in China. The best place for tourists to appreciate the fascinating mythical scenery of Dinghu Peak is by the side and on the bridge across the green and limpid 9-Winding Stream. Next to the Dinghu Peak is the Tongzi Peak (Tongzi means baby in Chinese. ), which is 40.7 meters high. People always call it little stone bamboo shoot because of its shape. Drifting is as long as 7.68km. Here the crystal water is clear to bottom. Hills on both sides of the stream are green and charming. Sitting on the bamboo raft, flowing on the stream gently, sometimes rapidly over shoals, tourists would get away from the noise and pollution of the city and indulge in the carefree, snug and quiet atmosphere in the crystal water, blue sky, green mountains surroundings. Your guide will meet you at the Shanghai Hongqiao Railway Station. The guide will accompany you to take the bullet train for around 3 hours to Lishui city, Zhejiang Province in the morning. The local car and driver will meet you at Lishui Railway Station. After lunch, you will check in the hotel and take a short rest. Later you will head south for Anciet Weir Painting Village (around 20km on the way), cruising and tour for around 1.5 hours. Afterwards you will be back to Lishui City and overnight here. Check out your hotel in the morning. Then drive northeast for around 60km/1h10m to Jinjun County to visit Xiandu (means the Capital of Celestial Beings in Chinese) and tour here for around 2 hours. In fact, The Xiandu Scenic Area around is quite gigantic in scale. It would take around one full day to totally tour here. 2-hour-long visit doesnt seem enough. So well go directly to the essential and most famous part - Dinghu Peak Area and start feasting on the breathtaking wonderland like scenery, stepping on the weir to cross the charming stream and enjoy the fascinating mythical scenery of Dinghu Peak , the No. 1 Peak and No. 1 Bamboo Shoot in China, by the side of the green and limpid Nine-Winding stream. The best place for tourists to appreciate the taking cable car to get up to the top of the mountain to have a panoramic view of the 9-Winding Stream and fascinating peaks. 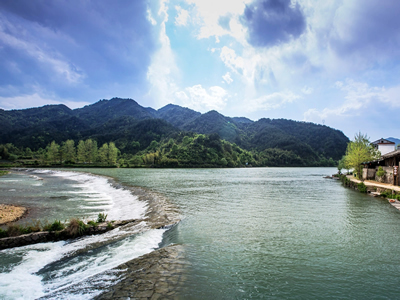 After lunch, you’ll head east for Yongan Stream in Xianju County. It will take around 80km/1.5 hours to reach this picturesque stream. Tour and take drifting here for around 2 hours. As the day draws to the end, you will drive for around 10 minutes to Xianju County town and stay overnight here. Today you will do Sightseeing at Mt. Xianju (means "Celestial Being Residence" in Chinese) for around 6 hours (Because no restaurant to take lunch in the mountain, please prepare some cold food as lunch by yourself). The mountain was so named because of its fairyland like scenery. This mountain is famous for its grotesque peaks, deep and serene valleys, picturesque forests, spectacular waterfalls. Legend says celestial beings chose here as their land for its picturesque mythical landscape. Afterwards, drive from Mt. Xianju to the West Railway Station at Jinyun County for around 85km/1h20m. Taking the bullet train in the evening or early night and after around 2.5 hours, you will arrive at the Hongqiao Railway Station in Shanghai. Single Room Supplement: CNY 458. 1. 2nd class seat train ticket between Shanghai to Lishui city, and from Jinyun to Shanghai. 4. Entrance ticket to the attractions as listed in the itinerary, include cable car to the top of Dinghu Peak,and cable car in Mt. Xianju..